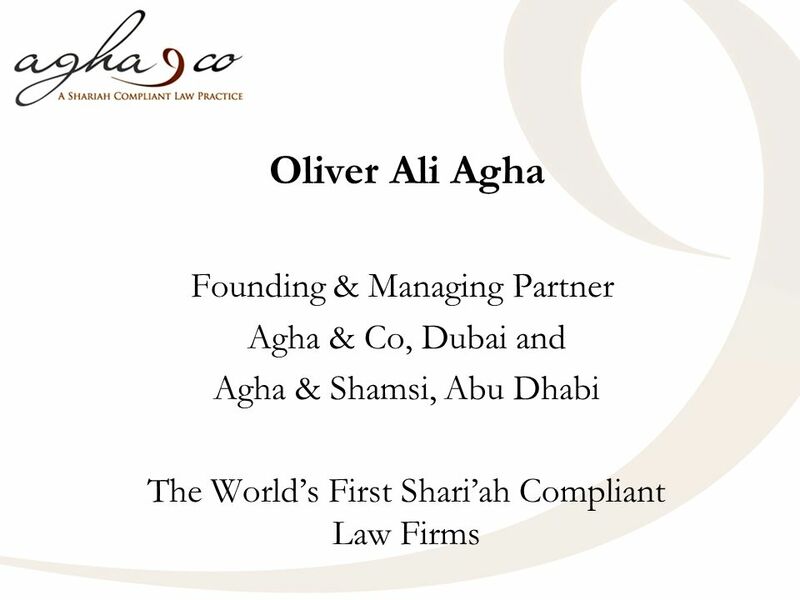 Oliver Ali Agha Founding & Managing Partner Agha & Co, Dubai and Agha & Shamsi, Abu Dhabi The Worlds First Shariah Compliant Law Firms. 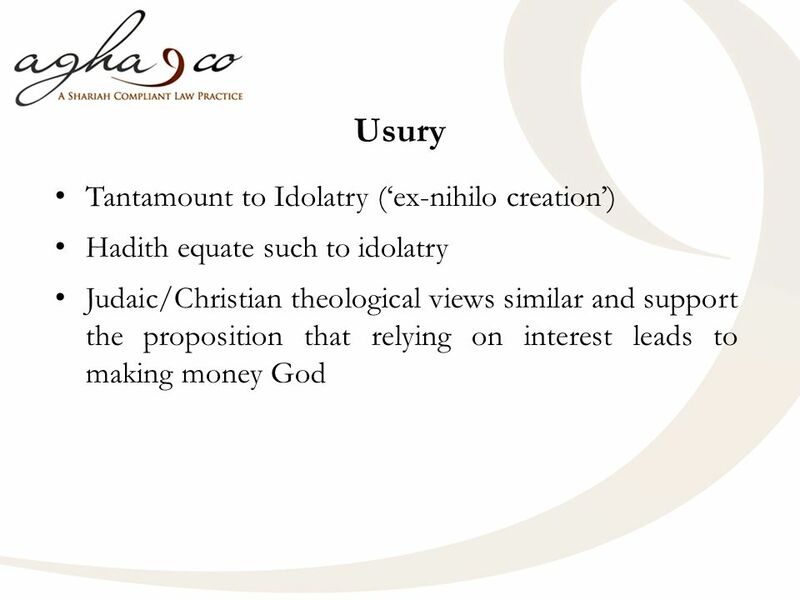 4 USURY - Disdained The Old Testament casts the usurer with blood shedders, oppressors, rapists and idolators (Ezekiel 22, Verse 2). In the New Testament, Jesus said: Love ye your enemies, and do good and lend, hoping for nothing again. (Luke 6, Verses 34-35). 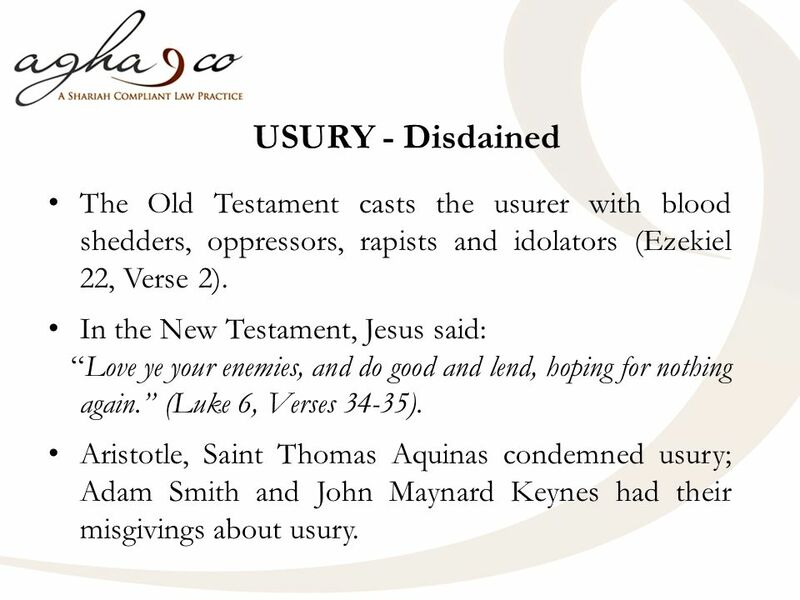 Aristotle, Saint Thomas Aquinas condemned usury; Adam Smith and John Maynard Keynes had their misgivings about usury. 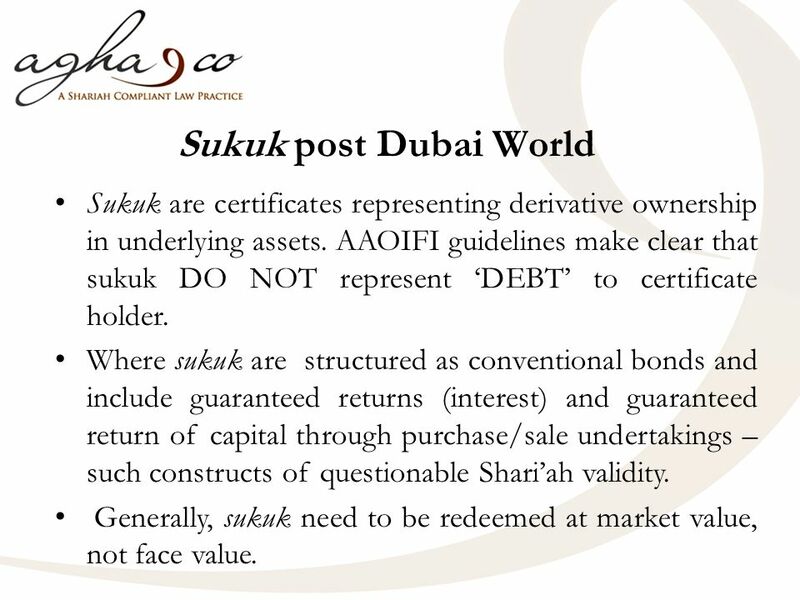 7 Sukuk post Dubai World Sukuk are certificates representing derivative ownership in underlying assets. 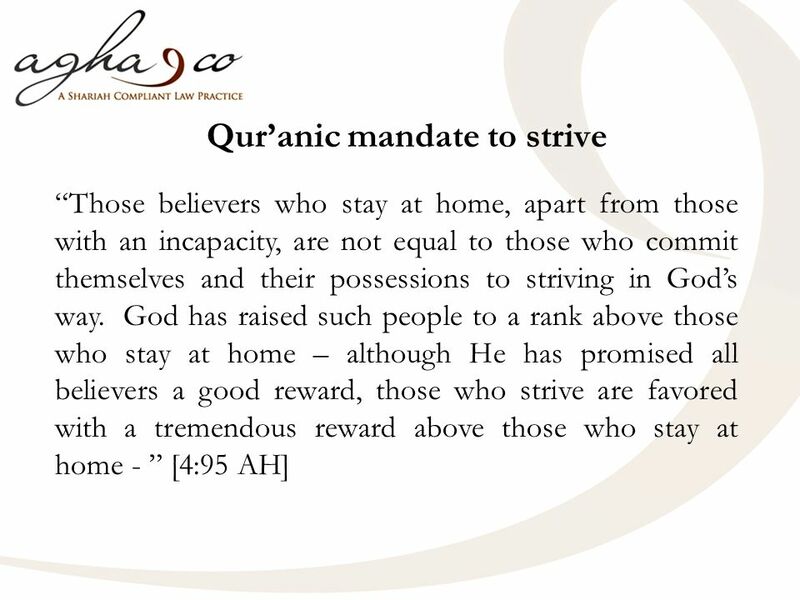 AAOIFI guidelines make clear that sukuk DO NOT represent DEBT to certificate holder. 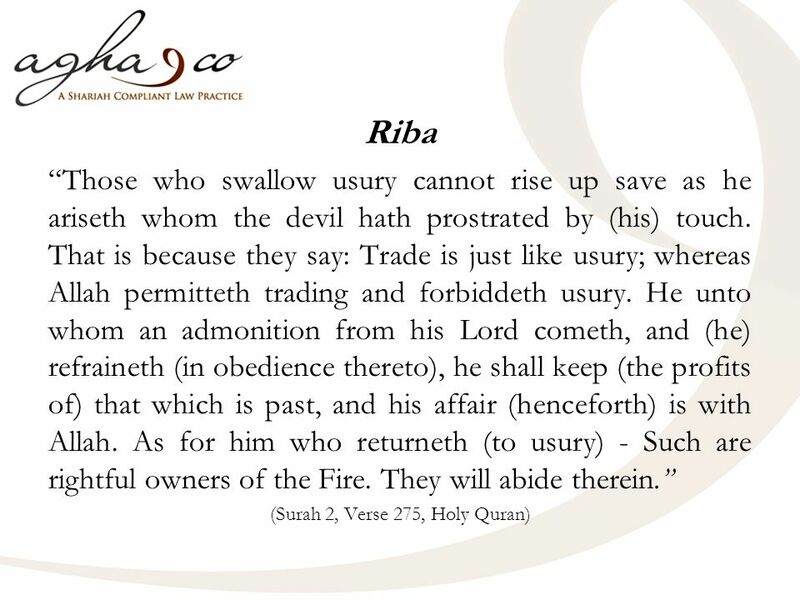 Where sukuk are structured as conventional bonds and include guaranteed returns (interest) and guaranteed return of capital through purchase/sale undertakings – such constructs of questionable Shariah validity. Generally, sukuk need to be redeemed at market value, not face value. 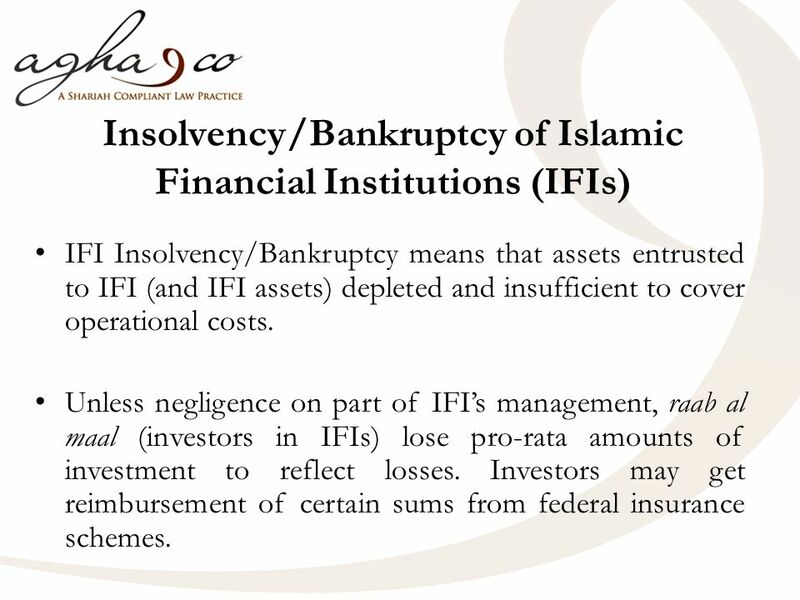 8 Insolvency/Bankruptcy of Islamic Financial Institutions (IFIs) IFI Insolvency/Bankruptcy means that assets entrusted to IFI (and IFI assets) depleted and insufficient to cover operational costs. Unless negligence on part of IFIs management, raab al maal (investors in IFIs) lose pro-rata amounts of investment to reflect losses. Investors may get reimbursement of certain sums from federal insurance schemes. 9 Just Debts Commercial contracts and permissible debt arrangements (e.g. Qard Hasan) NOT impermissible interest (riba) elements or disguised interest. 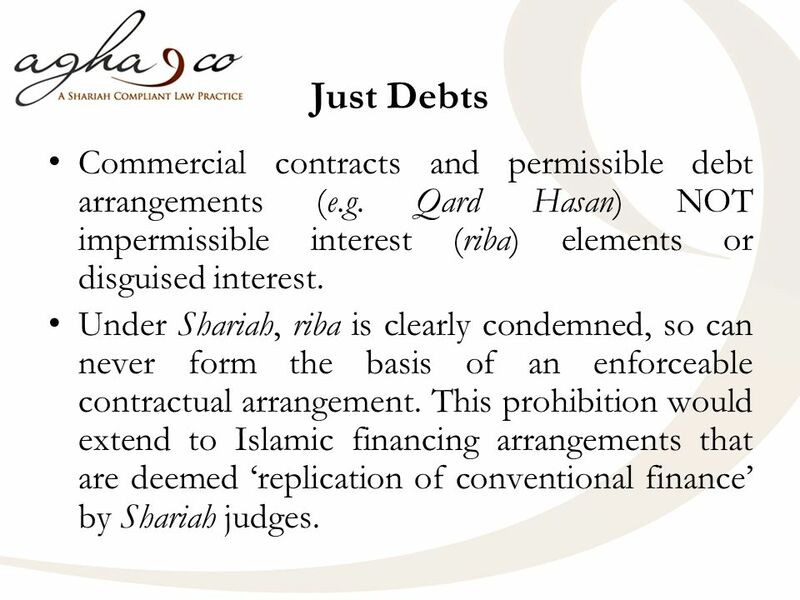 Under Shariah, riba is clearly condemned, so can never form the basis of an enforceable contractual arrangement. This prohibition would extend to Islamic financing arrangements that are deemed replication of conventional finance by Shariah judges. 10 Payment Priorities? 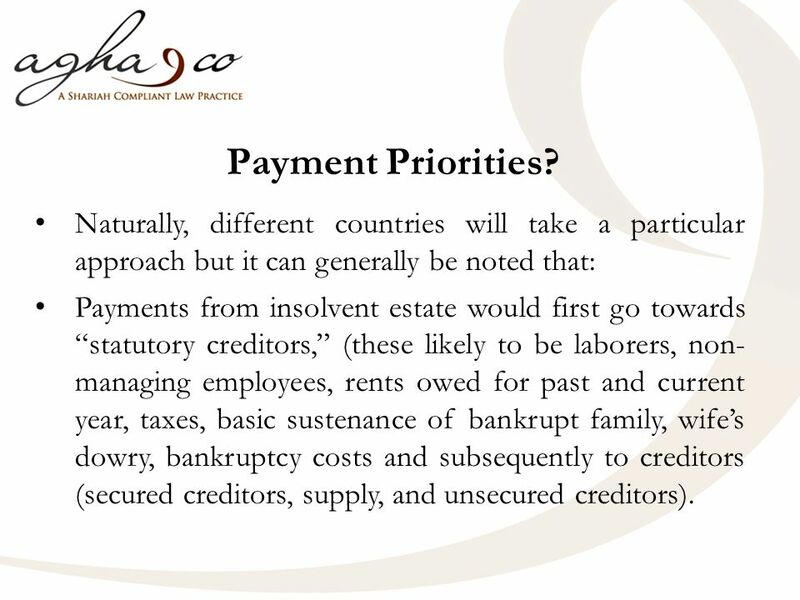 Naturally, different countries will take a particular approach but it can generally be noted that: Payments from insolvent estate would first go towards statutory creditors, (these likely to be laborers, non- managing employees, rents owed for past and current year, taxes, basic sustenance of bankrupt family, wifes dowry, bankruptcy costs and subsequently to creditors (secured creditors, supply, and unsecured creditors). 13 This presentation is solely intended for educational purposes and should not be relied upon for any particular query. 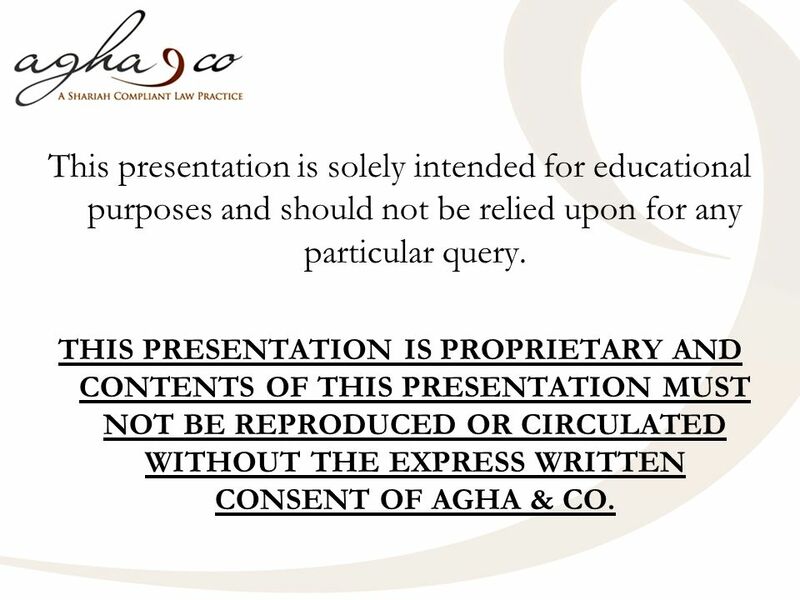 THIS PRESENTATION IS PROPRIETARY AND CONTENTS OF THIS PRESENTATION MUST NOT BE REPRODUCED OR CIRCULATED WITHOUT THE EXPRESS WRITTEN CONSENT OF AGHA & CO.
Download ppt "Oliver Ali Agha Founding & Managing Partner Agha & Co, Dubai and Agha & Shamsi, Abu Dhabi The Worlds First Shariah Compliant Law Firms." TAKAFUL THE ISLAMIC INSURANCE Dr Imran Usmani. Conventional Insurance It means a way to provide security / and compensation of what is valuable in the. Fortune Securities Limited | Equity Research Fortune Islamic Services Islamic Capital Markets A New Dimension Faraz Younus Bandukda Chief Executive Fortune. Legal Document Preparation Class 9Slide 1 Basic Debtor-Creditor Terminology Debtor: person who owes the money Creditor: person to whom the money is owed. Evolution of security interests in C19th UK John Armour. Essentials of Islamic Finance – IU Gulshan Campus, Slide # 1 Essentials of Islamic Banking and Finance IRSHAD AHMAD AIJAZ Advanced. WEEK 14: FINANCIAL MANAGEMENT -2 BUSN 102 – Özge Can. 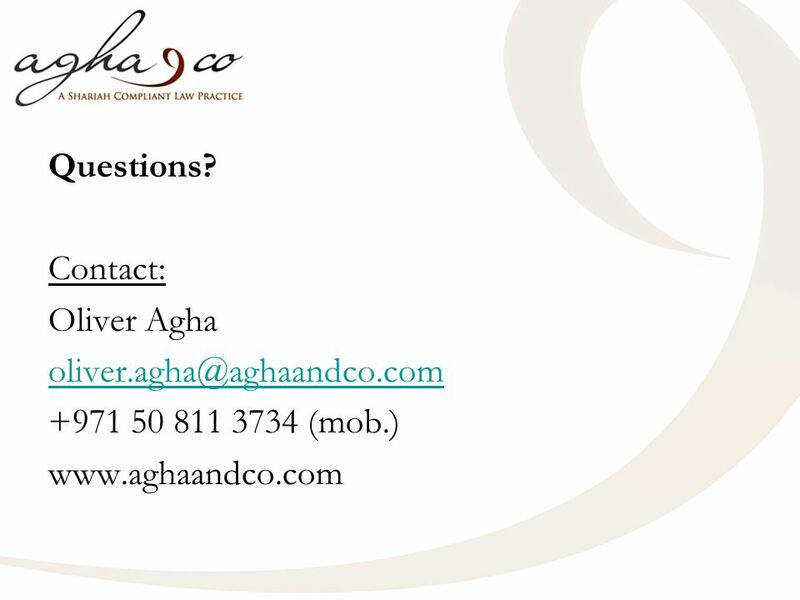 Al – Huda Trainings Ch. Hamad Rasool Bhullar REITs – the Concept REITs are unique Real Estate Investment Trusts as the name suggests, these are trusts. Chapter 16 Financing. 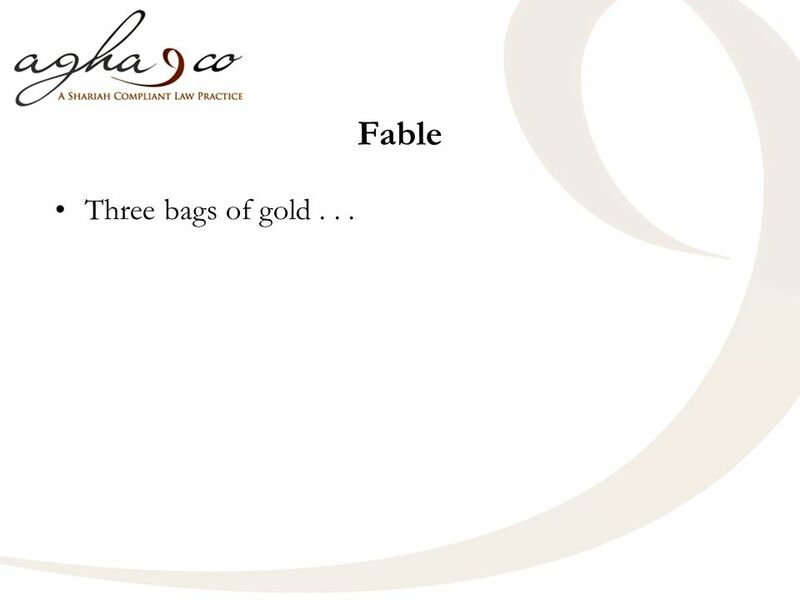 Learning Objectives  Identify the common methods of debt financing for firms.  Identify the common methods of equity financing. 1 The conflict between the Shari’a and conventional business and finance laws – a practitioner’s perspective Richard T de Belder Partner Denton Wilde Sapte.